Well its been one of 'those' months where all my time seems to have been concentrated from doing very little into doing everything at once, even I have had difficulty in keeping up with events! The car (naturally) has continued to 'simmer' in the background and I managed to hit all of my key dates for completing the thing. 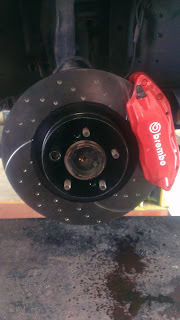 As mentioned in my last post, I managed to secure a set of R34 front and rear Brembo's to upgrade the stopping power on the car. Now these are in place it made all the effort that was put into doing it, worth it. Pins etc, crud cleaned off by me! The total expenditure was/did get a little out of hand and I could have converted the fronts only to a bigger 6 pot set. However this would have only replaced the fronts and although not necessary I would have probably wanted to also do the rears as well. 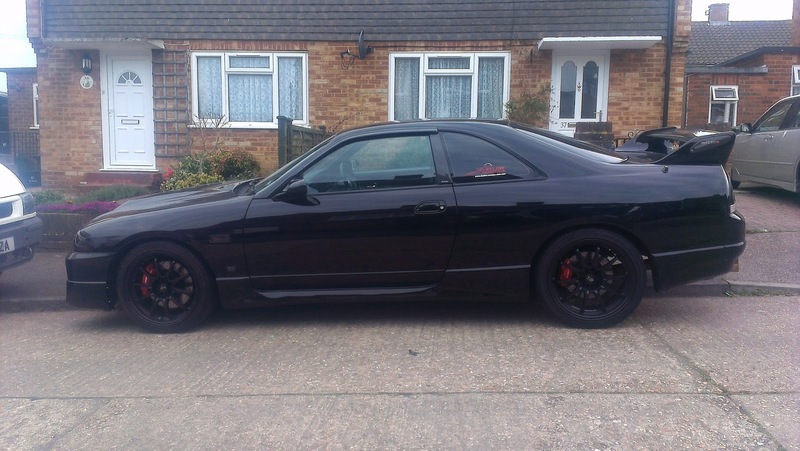 It did help considerably that the garage already had a buyer for my old front set up and the calipers will live on a 200SX (in black). 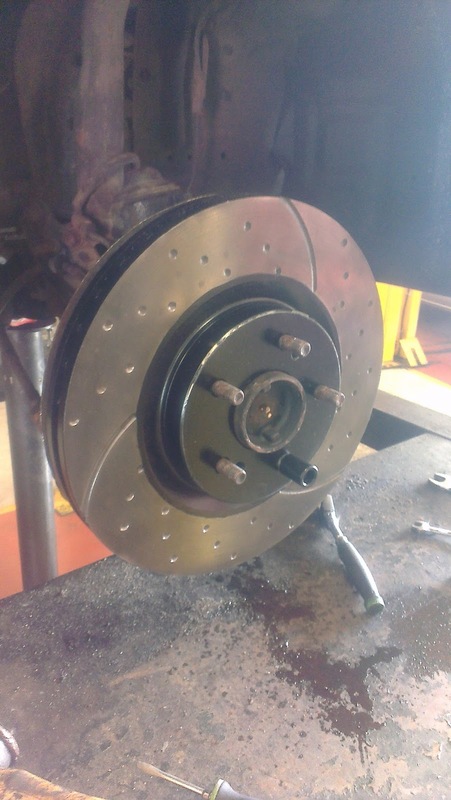 Originally when I received the brakes they were in a usable but poor state, the discs were of a high quality and showing little signs of wear or unusually corrosion. These are branded DBA, the centres and outer edges being painted black. I took an electric wire brush to these removing all the old tatty paint and repainted them in black VHT paint. 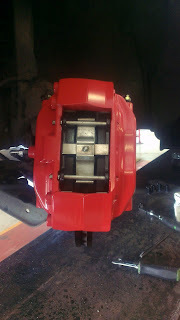 The pads supplied were DBA Redstuff, although not showing a great deal of wear I decided pretty early on to bin them as unfit for the job. Some people swear by these and some loathe them. Personally I had no real opinion, it was just that I wanted what 'I know' to be half decent. 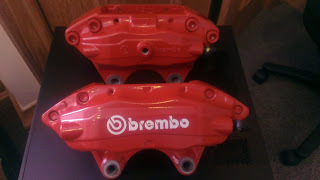 The calipers were in a reasonable state, although this was not going to prove to be an issue as it was always my plan to have them rebuilt. At some stage of their life the gold calipers had been over-painted in red by hand. Although it must have been very good caliper paint, as it was rock hard, so I soon abandoned that and left it to the re-furbishers. I spoke to a few companies specialising in the refurbishment and supply of brake parts. I can safely say that the best I found was Ben at Godspeed brakes (link at the end). No other reason than I liked their web site and liked what he had to say. Currently I am still waiting for one firm to give me a call back which is odd considering the current economic climate, you would think everyone is keen for work! The process of changing over was reasonably straight forward, the calipers removed and the old discs came off (annoyingly) without any struggle at all. I felt sure that they would be welded into place and looked forwards to watching Andy struggle with them, foiled again! 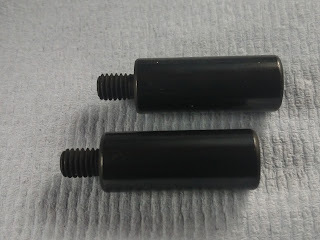 The old M12 1.25 pitch bolts were used as the GT-R bolts were a lot longer and this saved stuffing a load of washers in to pack them out. 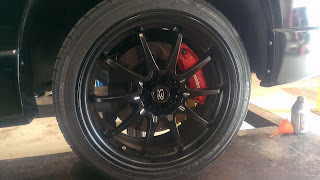 The old pipes and brackets from both the front and rear calipers were also ditched as my braided hose fitted straight on. The only modification was to the front disc splash guard which had to have it's lip flattened out to clear the disc. The 300mm rear discs fitted right in without any further work. 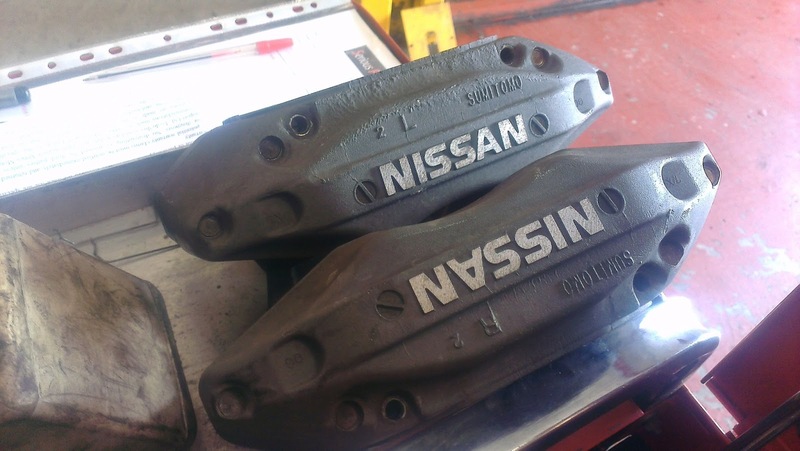 The pads were going to be Ferodo sports pads all round, although true to form this 'easy' bit didn't run smooth with the garages supplier forgetting to order parts. 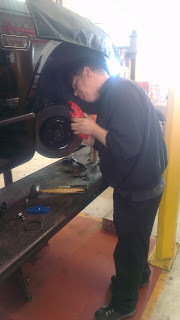 Luckily Andy (keeper of everything) had a set of Lockheed pads hidden away for the rears and the back plates were removed from the original Redstuff pads to fit them. 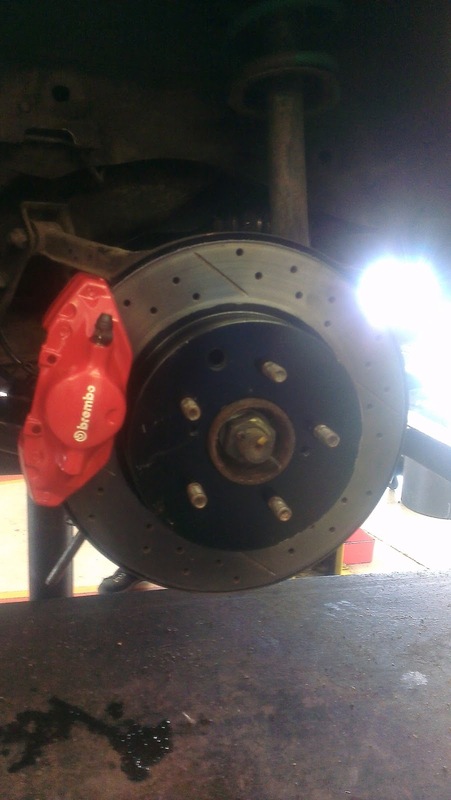 Living with the new brakes: Well these make me feel like my original brake set up was worn out! I know it wasn't though, so can only say that the result is pretty staggering. They have a great deal of bite from cold and are massively more responsive. They also look good, shouting out from behind my Rota's "hello! Look at meeee!" 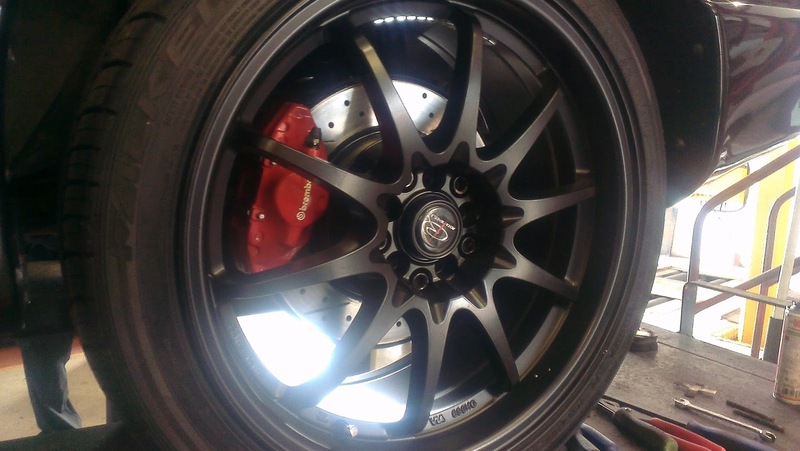 My thanks go out to Godspeed Brakes for having made such a fantastic job at refurbishing Andy and Nettie at Serious Performance Auto's Eastbourne Tel: 07501 706023 for having done their normal very high standard of work and lastly to Sarah, who suffered, assisted and put up with my crazy plans. Black and Red go well together. Karl - looking great! Hope that the caliper refurb included making sure the seals and rings were still ok.
Hi Ali, yes they were fully refurbished and as good as brand new. 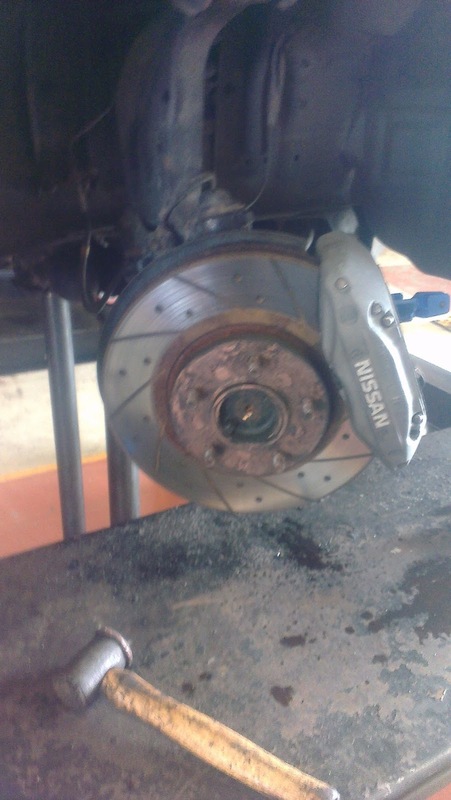 Oddly the rears were more worn than the fronts! Still loving them.